Sterling Marlin to the finish by .943 of a second on Aug. 5.
lowest starting spot of any Brickyard 400 winner. never dreamed it. It feels unbelievable." 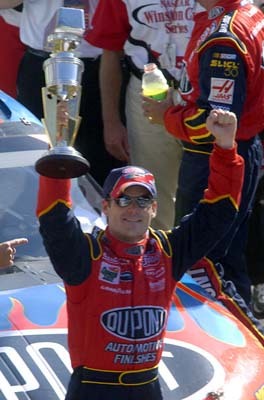 Johnny Benson was third in the No. 10 Valvoline Pontiac. rookie, in fifth in the No. 97 Sharpie/Rubbermaid Ford. 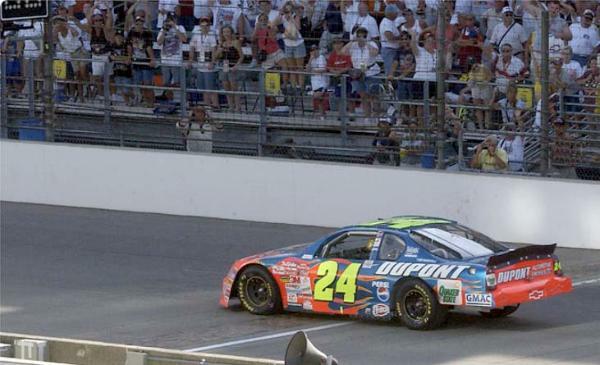 Brickyard 400 victory in just the eighth running of the event. 1936, the 24th running of The Greatest Spectacle in Racing. win, the statistics will come after that. Three Brickyard 400s. allowed Gordon to pass Marlin for the lead in Turn 1. "The car was just on rails after that," Gordon said. stages of the race, as he led three times for 39 laps in the No. Earnhardt Jr. on Lap 104. Lap 132 with Gordon and many other of the leading cars. But Park exited that stop in eighth, ending up seventh. thereafter due to handling problems. The race was slowed by seven caution periods for 28 laps.